Do you have the An Infant Massage Guidebook textbook? See your enrollment options above for "I already own the text". 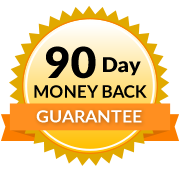 This course is for every massage or bodywork practitioner who wants to be more knowledgeable about giving massage to well, premature and special needs infants. 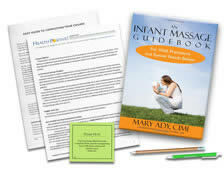 The textbook, written by Mary Ady, CIMI, NCTMB, presents the research-backed benefits of massage for newborns; a description of more than 50 common infant health disorders; an aromatherapy guide for infants and toddlers; internet links for further study and support, and a bonus section with step-by-step illustrations of how the author conducts an infant massage routine. 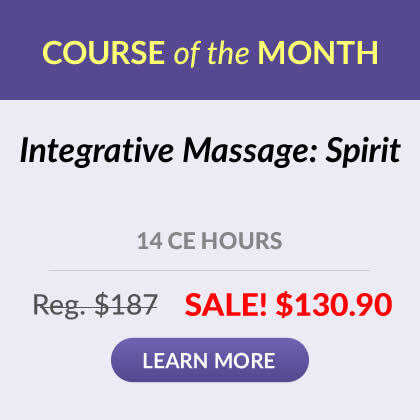 Note: Although this textbook contains several well-illustrated chapters on specific infant massage techniques, the test and CE hours for this course DO NOT include those chapters. We consider those chapters bonus material. Please seek additional experience, with a mentor, to add hands-on skills. Great book to reference with! I am excited to share some of the techniques I learned from this course with my clients that are new mothers and those expecting! I enjoyed the course very much, and since I also have an infant at home, will practice it regularly. Great facts and resources. I learned valuable information and I cannot wait to communicate it with my clients and use this new information to help infants, children and their families! I think this class is excellent. I believe every Mother should read this. Babies thrive on being close to someone and I feel that sometimes as health care practitioners it is our job to help Parents be more comfortable at giving love to their babies. It a lot of times has to be a learned skill. Thank you for this information. This was an ok beginning course. Was good on aromatherapy and excellent on various difficulties of infant's massage work. Was ok especially for a beginner for which this course was designed. The course gave me new insights into infant massage! I love the book and itâ€™s layout; very easy reference to specific conditions and knowledgeable information. Enjoyed the fact that the book was divided into information and techniques. Iâ€™m excited to have this in the tool belt for reference if I ever need it or get asked questions pertaining to infants. Thank you. Describe the benefits of infant massage as it applies to overall homeostasis and to each body system. List specific potential hospital cost savings for providing massage to premature babies. List the most prevalent newborn health conditions, diseases and disorders and how they affect each body system. List the most current research, categorized by body system as it relates to massage for well, premature and special needs babies. Preterm infants who received infant massage gained an average of 47 percent more weight, became more socially responsive, and were discharged six days earlier, at a hospital cost savings of $10,000 per infant, or a total of $4.7 billion dollars. Although the underlying mechanism for this relationship between infant massage and weight gain has not yet been clinically established, possibilities explored in studies with both humans and rats include increased protein synthesis; decreased cortisol levels and increased vagal activity that releases hormones and enhances gastric motility may have significance.